In 1985, the Danish Government with the help of the Royal Danish Consulate in St. Thomas, started collecting data from the Danish part of the cemetery in Charlotte Amalie. For years, St. Thomas resident, Mr. Holger Thorsoe had been interested in the historical significance of the cemetery. Upon his death in 1989, his widow, Alma Jensen Thorsoe decided that donations in lieu of flowers be made in his memory to a restoration fund which would be established to perpetuate the care of the cemetery. Thus, the Danish Cemetery Restoration Fund, a non-profit organization, was started. 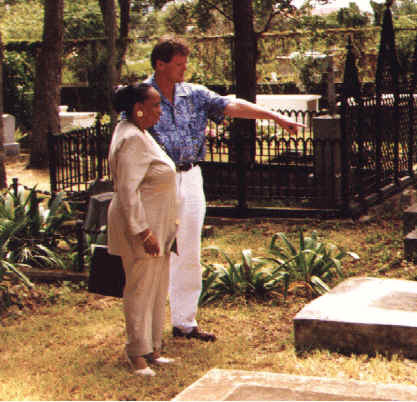 In 1996, the Restoration Fund was expanded to include the two Danish cemeteries in St. Croix, one in Christiansted and another in Frederiksted. The cemeteries are maintained today through an annual allotment from the Danish Government and supplemented by private donations from individuals. The purpose of this fund is to restore and maintain these cemeteries as a symbol of respect for the people buried there and to hopefully preserve this legacy for generations to come. In the islands it was customary to be buried on the estate where one belonged and you will find many grave sites and small cemeteries in many places. However, regular cemeteries as we know them are found in the towns. They bear great testimony to a way of life few of us remember, of shipwrecks, hurricanes and yellow fever. You will find military men next to former governors, missionaries and traders. A lot is history is "buried" here. Charlotte Amalie - Situated amidst a busy residential and commercial area known locally as "Hospital Ground", the cemetery is surrounded by an old stone wall and sheltered by ancient mahogany trees. 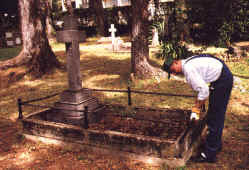 In 1985, work was undertaken to clean up this mostly untouched area which involved the very time consuming project of cleaning the tombstones, repairing markers and fences and documentation of all data by name, location and condition of each burial plot. This information is now stored in archives in the Virgin Islands, England and Denmark. A number of graves are marked by massive stone pillars of marble and granite. Remarkably, the inscriptions on some pillars dating back to the 1800's and earlier are still as clear as the day they were first chiseled. The use of heavy link chains was common in the cemetery as a reminder that until 1917 it served as a military cemetery. Many high-ranking men from the army and navy are buried here. The graves are shaded by the many tall mahogany trees which create a peaceful, serene atmosphere to visitors on sunny afternoons, however; these very same trees are responsible for the most severe damage to the markers when their limbs break and fall during tropical storms and hurricanes. For this reason, the trees require constant attention and pruning to prevent further damage to the grave sites. Work is now underway through the efforts of the Royal Danish Consulate to photograph, number and prepare a brief history for each grave site in the St. Thomas Danish cemetery, many of which you can view in the pages to follow. It is a massive undertaking because of the ravages of time and weather on the burial sites. In the near future, a web site is planned to be operational for those interested parties who wish to delve into tracing their ancestry. Visitors to Christiansted will find this Danish cemetery at the western end of Company Street. Gaining entrance through the gate, quite a few headstones will be found that bear such well-known names such as Oxholm, Moltke and Willemoes. Interspersed within the Public section of the cemetery, there are a number of graves from the years of Danish rule which need to be registered and cataloged. There is also a memorial dating back to 1920 commemorating Danes who died while serving their country. Work has begun under the supervision of the St. Croix trustees of the Danish Cemetery Restoration Fundto repair and restore the broken markers and grave sites. The old stone wall at the entrance to the cemetery has been repaired after it was damaged by a fallen tree. There are several projects schedule for this year including restoring the rest of the grave sites and installing chain link fencing on the northwest of the lawn. Trees and shrubbery will be planted in front of the newly refurbished stone wall. 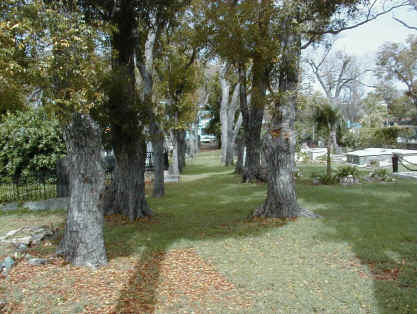 This cemetery is located on New Street opposite the Lutheran Church. Immediately after entering the grounds, nestled under a tree are the graves of two gendarmes killed in the 1878 Fireburn uprising. Nearby is a memorial very similar to the one found in the Christiansted cemetery commemorating the military personnel interred here. On the east side of the Lutheran Church Yard is the grave of Frederik von Scholten, the brother of famed Governor and General Peter von Scholten who will be remembered for his role in freeing the slaves in 1848. A number of graves are marked by massive stone pillars of marble and granite. Remarkably, the inscriptions on some pillars dating back to the 1800's and earlier are still as clear as the day they were first chiseled. The use of heavy link chains was common in the cemetery as a reminder that many high-ranking men from the army and navy were buried here. The graves are shaded by the many tall mahogany trees which create a peaceful, serene atmosphere for visitors on sunny afternoons, however; these very same trees are responsible for the most severe damage to the markers when their limbs break and fall during tropical storms and hurricanes. For this reason, the trees require constant attention and pruning to prevent further damage to the grave sites and tombstones. Work is now underway through the efforts of the Royal Danish Consulate to photograph, number and prepare a brief history for each grave site in both the St. Thomas Danish cemetery and the Danish Cemeteries in St. Croix, many of which you can view in the pages to follow. It is a massive undertaking because of the ravages of time and weather on the burial sites. In the near future, a web site is planned to be operational for those interested parties who wish to delve into tracing their ancestry. 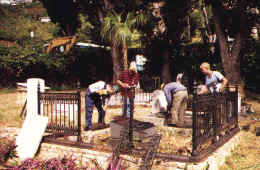 In the spring of 1999, three welders arrived in St. Thomas from Denmark to restore several of the ornate cast-iron fences which surround many of the graves in the St. Thomas cemetery. Karl Pedersen, Carl Petersen and Uwe Sorensen came well equipped, bringing along specialized welding rods from Denmark as modern day welding techniques and materials could not be used on this particular ironwork which is several centuries old. This project was spearheaded by Hans and Joanna Mathiesen, Danes and frequent visitors to St. Thomas who appreciate the historic value of these cemeteries. The Mathiesens have also been instrumental in establishing a fund in Denmark specifically for raising funds to maintain and restore the Danish cemeteries in the U.S. Virgin Islands. 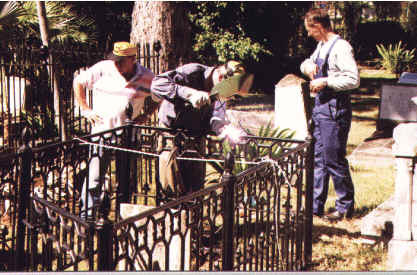 Karl Pedersen, Carl Petersen and Uwe Sorensen and Trainee Peter Bech pictured repairng the iron fence of a grave. 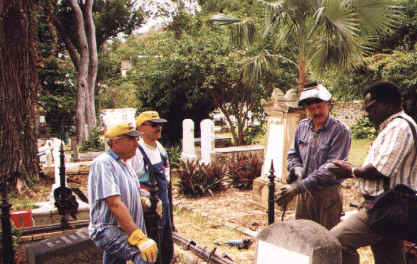 Uwe Sorensen works to restore the iron railing protecting a plot in the St. Thomas Cemetery. Karl Pedersen, Carl Petersen and Uwe Sorensen take a brief rest to talk to a reporter from the Virgin Islands Daily News. While Karl Pedersen and Uwe Sorensen look on, Carl Petersen uses the special wielding rods, donanted by A/S Esab., Trekronegade 92 2500 Valby, to repair cast iron fencing. Consul General S�ren Blak reviews on-going work with Virgin Islands' Senator Judy M. Gomez.